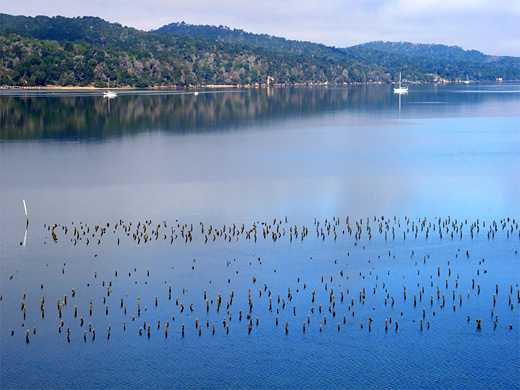 Forty miles north of San Francisco, Tomales Bay is a straight, narrow inlet a mile wide and 13 miles long, separating Point Reyes Peninsula from the California mainland, and lying directly on top of the San Andreas Fault, along which the peninsula is inexorably moving northwards. 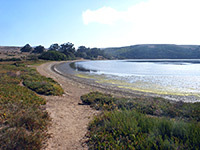 The bay itself is managed by the NPS (part of Golden Gate NRA), as is most of the peninsula, but two small sections of the shoreline on each side of the bay are a state park, established in 1952, and offering rather limited activities of sunbathing, swimming, bird watching and walking, along short trails through a forest of Bishop pines. The landscape is quite pretty, however, and the bay is a good subject for photography, with calm, reflective waters backed (on the west side) by verdant green woodland, often enlivened by the interplay of sun and mist - Point Reyes is one of the foggiest locations on the California coast, but the low cloud tends to persist only a few miles inland, about as far as the bay. A fee is charged to enter the west section of the state park, but not for the less developed east section. California Highway 1 runs all along the east shore of Tomales Bay, though despite its primary designation the road is narrow, winding and little traveled, curving around many small, steep ravines and through isolated, dense groves of oak trees. Most of the land nearby is hilly and grassy, used for cattle ranching, unlike the slopes on the moister west side of the bay (Inverness Ridge), that are covered by thick forest. 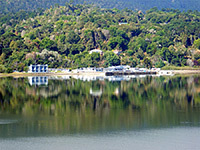 The state park occupies two peninsulas, west of the road, and the main site is Millerton Point which has a beach, picnic area and carpark, plus several trails leading along the water's edge and to the top of a small ridge that is just high enough for good views up and down the bay, to the buildings of Inverness opposite, and over a large area of oyster beds, the posts from which form symmetrical patterns in the smooth water. Half an hour is enough to walk the loop path and get a good appreciation of the scenery. 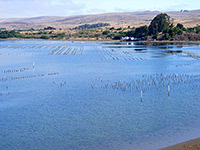 The most visited and developed section of Tomales Bay State Park is on the west wide of the inlet, one mile across from the eastern portion but 13 miles by road, via Sir Francis Drake Boulevard, the main route into Point Reyes NRA. The highway turns inland just north of the residential village of Inverness and forks after a mile; the park is reached by turning right here (Pierce Point Road) then right again soon after, a road that descends through the forest and ends at Hearts Desire Beach, where facilities comprise picnic areas, rest rooms, drinking water and parking. Three other sandy beaches in the park are reachable on foot - Indian to the north, Pebble and Shell to the south. Indian Beach has the added attraction of two replica dwellings of the Coast Miwok tribe, the original inhabitants of this area. The path through the Bishop pine woodland (the Jepson Trail) starts at the parking area and loops through the trees for one mile, intersecting with several other routes further into the forest. 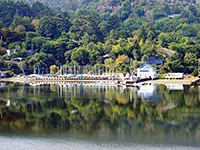 Nearby towns with hotels include Novato (23 miles), Petaluma (22 miles) and Rohnert Park (28 miles).